Gardening: What Are Bulbs, Corms, Tubers, and Rhizomes? Flower “bulbs” come in these forms: true bulbs, corm, tuber, tuberous root, and rhizome. So, what you might think of as a flower bulb may not be a bulb at all — botanically speaking, that is. True bulbs, such as daffodils, tulips, hyacinths, and snowdrops, often have a papery skin or tunic on the outside, much like an onion. Bulbs with a papery covering are called tunicate bulbs. The tunic helps protect the bulb from drying out when it’s resting or waiting to be planted. However, some true bulbs, such as lilies, don’t have a tunic. These bulbs dry out faster and are more easily bruised. They’re more or less rounded, sort of ball-like, and narrow to a point on the top. Leaves and flower stems appear from this point. 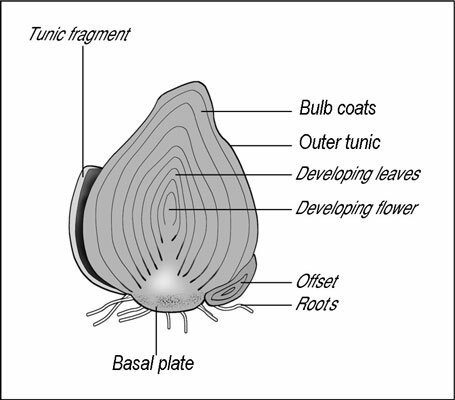 With or without a tunic, true bulbs have a flat part, called a basal plate, at the bottom. That’s where roots grow and also where shoots and scales are attached. True bulbs have new bulbs, called offsets, which form from the basal plate. When they get big enough, these offsets, or daughter bulbs, produce flowers on their own. True bulbs are made up of rings, called scales, which are modified leaves that store food. Cut apart a true bulb, such as a hyacinth, at the right time of year, and you can find a miniature flower inside, just waiting to begin growing. Perennial true bulbs add new rings each year, from the inside. Old rings on the outside are used up, but the true bulb itself persists from year to year. If any of the characteristics that identify true bulbs are missing, the plant isn’t a true bulb. Instead, it’s a corm, tuber, tuberous root, or rhizome. Popular corms include crocosmia, gladiolus, freesia, and crocus. Corms have a tunic. The tunic may be fibrous, what botanists call netted or reticulate, or the tunic may be smoother, with distinct rings, what botanists call annulate. Some crocuses have reticulate tunics, and others are annulate, which is one way you can tell crocus species apart. 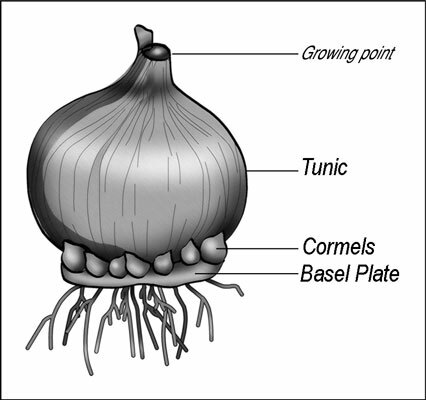 Corms have a basal plate at the bottom and one or more growing points at the top. Bulbs and corms both have a definite vertical orientation. Corms are undifferentiated, uniform, and contain no rings when cut apart. Corms are stem tissue, modified and developed to store food. The corm you plant is used up for growing the flower. Before it withers away at the end of the growing season, however, a brand new corm (sometimes several new corms) forms and replaces the mother corm. The new corm contains the food reserve for the dormant crocus or gladiolus until it’s time to grow again. You may not know it, but you might already be familiar with a popular tuber: the potato. Other tubers include tuberous begonia and cyclamen. Tubers lack a basal plate. 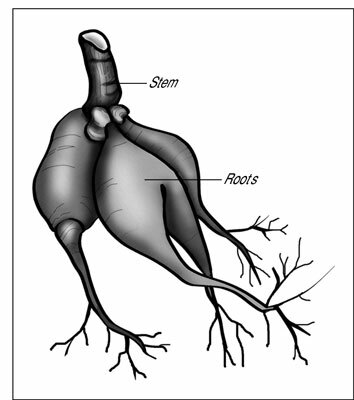 Most tubers root from the bottom. Tubers have several growing points, called eyes. More organized tubers, such as caladiums or tuberous begonias, have their eyes at the top. Some tubers, such as anemones, aren’t so orderly. Distinguishing the top from the bottom of the tuber may be difficult. If you’re not sure, plant it sideways and let the tuber figure out which direction to grow. Tubers are made of modified, undifferentiated stem or enlarged hypocotyl tissue. They have no highly specific internal structure. Tubers don’t make offsets or produce new tubers. Tubers usually just get bigger each year, making more growing points. Tuberous roots are modified, enlarged, specialized roots that store food, and are used up during the growing season to be replaced by new storage units. The tuberous roots cluster together, joined to the bottom of a stem. 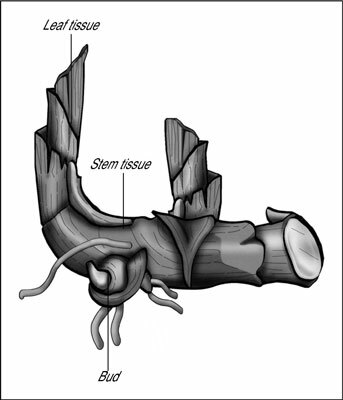 The stem contains the new growing point for the next year — a piece of root alone won’t grow. Examples of tuberous roots are dahlias, daylilies, and sweet potatoes. Rhizomes are stems that grow sideways rather than up, running along the surface of the soil or just below it. Plants that use rhizomes for food storage have fatter, more bulblike rhizomes, covered with a dry base of leaves. Rhizomes branch out, and each new portion develops roots and a shoot of its own. Familiar rhizomes include iris, lily-of-the-valley, canna, and ginger (Zingiber officinale).